Just south of Silver Springs is Buckland’s Station, an old two story house built in 1870 by Samuel Buckland from the dismantled materials from Fort Churchill. 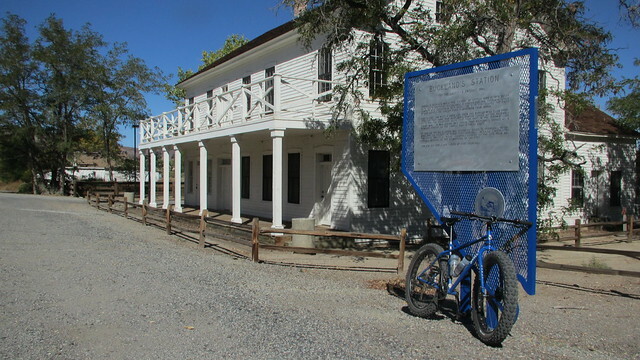 This site was once a Pony Express stop, supply center for early pioneers and nearby Fort Churchill, and a former hotel. Today it’s a quiet old building in a park setting under the cottonwoods along the Carson River. 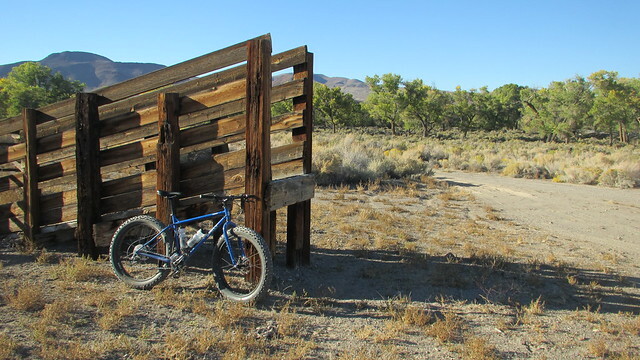 I had a free afternoon recently, and decided to make the station my trailhead for an exploration loop around the mountains. 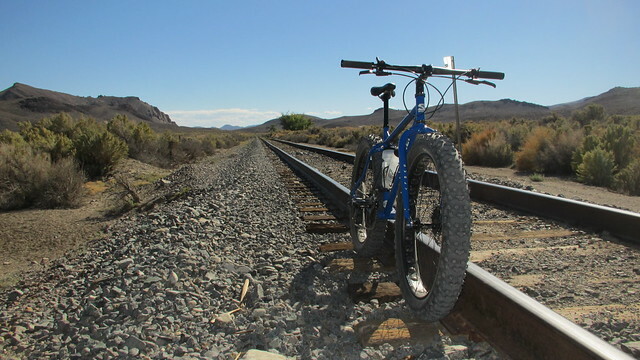 My ride would take me up into the desolate desert mountains, along the railroad through Adrian Valley, through an old 1860s Army fort, and down the Carson River. 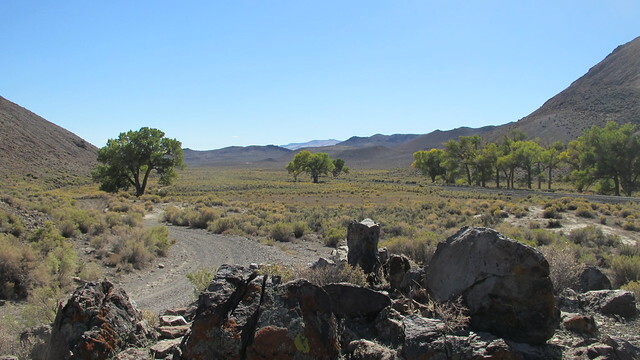 I parked at Buckland’s Station, just north of the Carson River bridge on Alt 95 south of Silver Springs. To start the ride, I headed south across the bridge. It looks wide enough, but the 18 wheelers travel this route at full speed. The sound they make over the bridge as they pass you at 65 mph is a bit unnerving. 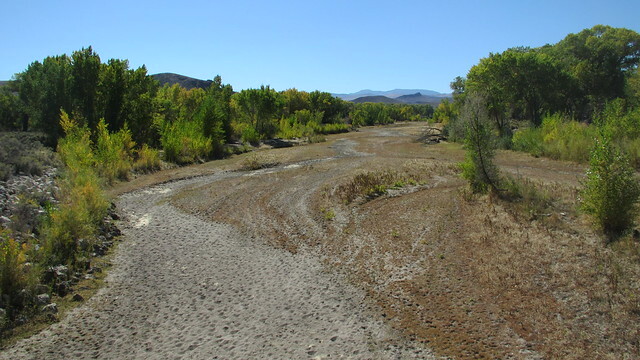 I didn’t waste any time getting across, only glancing down at the now dry Carson River bed underneath. 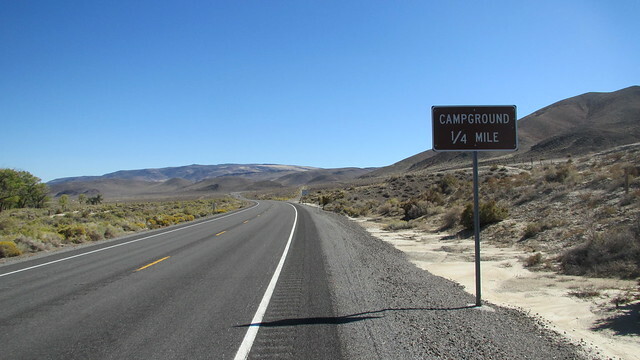 Shortly after the bridge, there’s an old section of abandoned highway just past the campground sign. It’s a good way to get off the road for a bit of relaxed climbing. 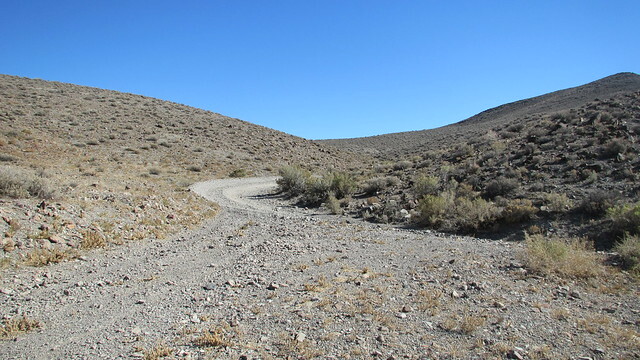 It rejoins the highway again after the curve, but the turnoff to the dirt road isn’t far ahead. 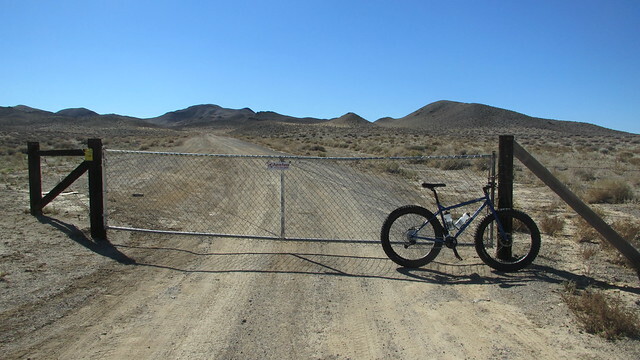 After a short stretch of riding the shoulder of Alt 95, there is a gated dirt road that takes off on the west side of the road. 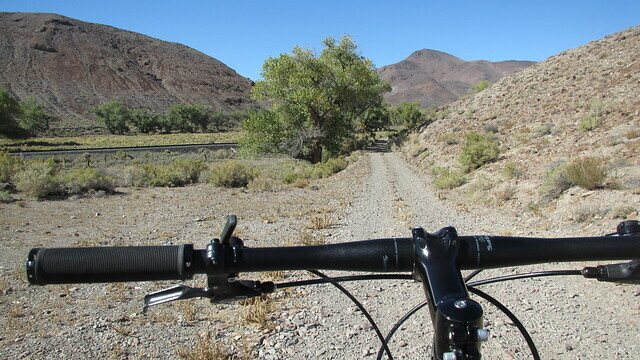 After closing the gate behind me, I rode southwest along the road to a mining area. At first glance upon reaching the mine, it appears there is broken glass everywhere. The sparkling, though, is actually coming from all the selenite crystals that cover the ground in this area. 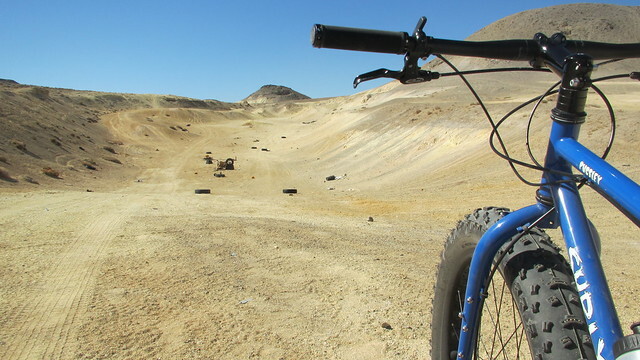 Continuing through the mining area, there is some fun terrain to ride through the open pits. 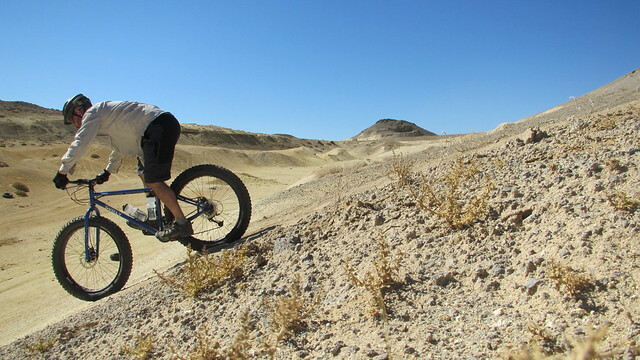 After exiting the pit on the far side, I reached the highest point of ride. It was time for some downhill to the valley below. 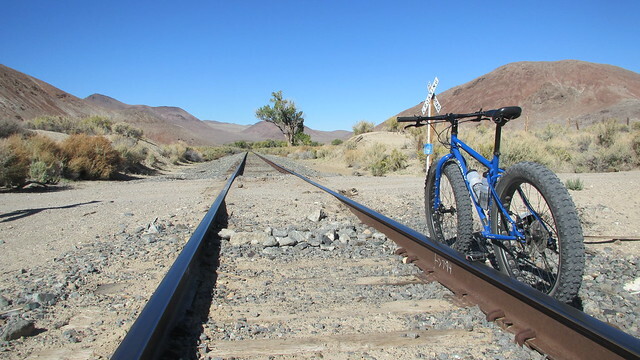 At the bottom of the canyon I reached the cottonwood lined railroad tracks in Adrian Valley. The tracks run the length of this quiet valley, and there are long views to the north and south. According to the map, this spot is marked “Churchill (Site)”, although there are no visible ruins in the tall brush. Further to the south is Churchill Station Spring and Churchill Narrows. 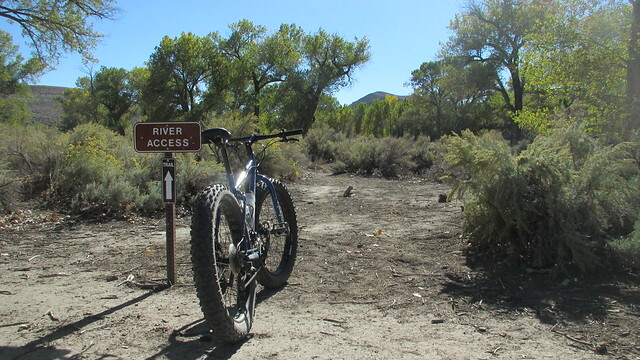 It looked fun to explore in that direction, but I pedaled on to the north towards the Carson River. I had to go around a few mud puddles, but I don’t remember any recent rains. It was strange for such a dry area. Soon I reached an intersection. I could continue north along the tracks, or head east up into the mountains. Heading east over the low pass is the quick way back, but I wanted to see the river trails. 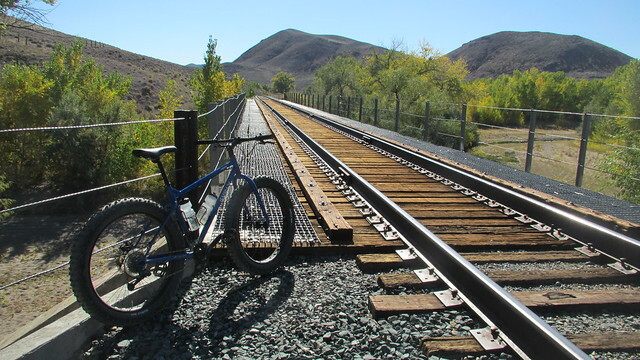 I finally reached the bridge where the railroad tracks cross the Carson River. There were no warning signs, and the grating bordering the tracks seemed to indicate it was safe to cross. It’s a fairly short span with a good line of sight, but I hurried across nonetheless. 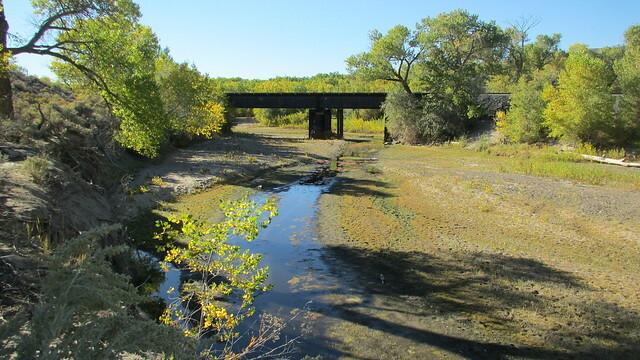 After crossing the tracks, I was near the group area and campground of Fort Churchill State Park. When I reached an irrigation ditch embankment, I jumped onto a little path called the Stewart Trail, which to my pleasure was OK for bikes. 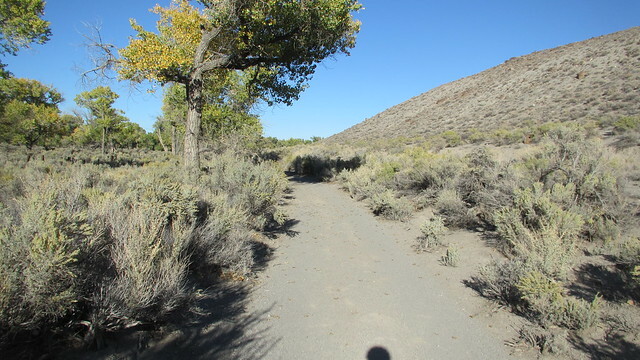 I took a short loop through the cottonwoods, then took a water break at the group picnic area. Refreshed, I headed over to the ruins of Fort Churchill. Built in 1861 to provide protection for early settlers and the Pony Express, Fort Churchill was once an active U.S. Army fort. 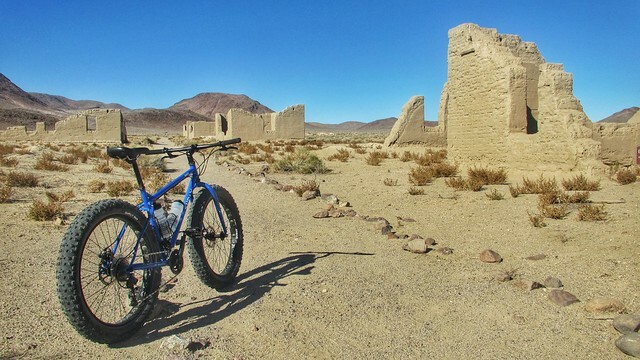 It was abandoned nine years later, but the ruins are still standing today. 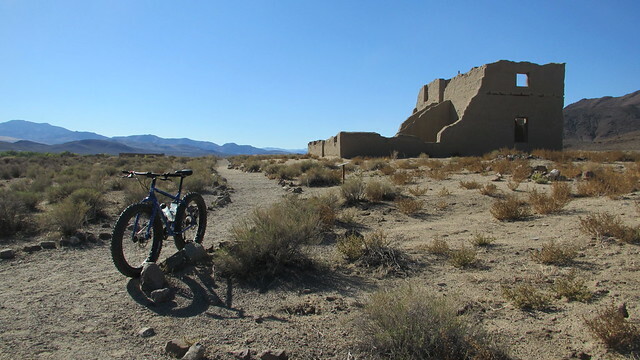 Again, I was happy to see that bicycles are allowed on the fort trail, as long as they stay on the path and away from the ruins. I made a slow tour through the old buildings, stopping for vistas and photos. At this point in the ride, I was probably an easy 10 minutes from Buckland’s Station on the pavement. 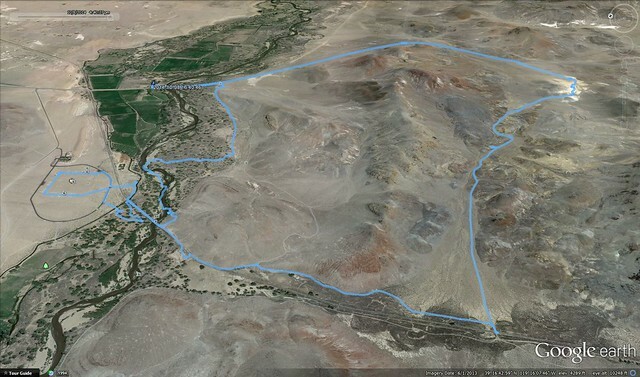 I thought it might be more adventurous, though, to cross back over the river and find the dirt roads I saw on the map I had studied earlier in the day. 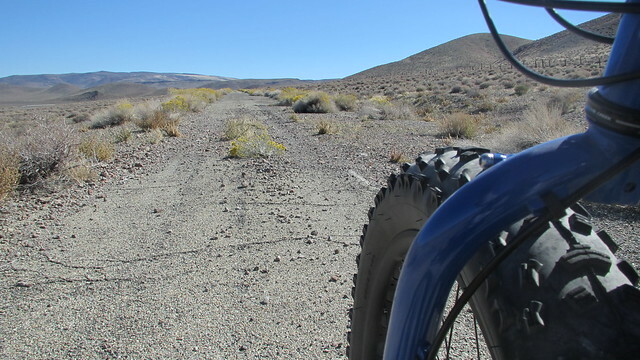 This decision definitely added some adventure to the ride, a flat tire, some scraped up legs, and easily a good hour. I followed a trail back to the bridge, but came to a dead end at a tree that I normally associate with thorns. I stopped and picked a different direction. As I got closer to the bridge, I noticed my front tire was deflating. I’m not certain if I hit a thorn or something sharp near the tracks. My tire was going flat quickly, though, so I wasn’t riding anywhere until I fixed it. Walking my bike back over the bridge and over a small hill, I picked a work area on a sandy cliff above the south bank with a good view of the bridge and cottonwoods. 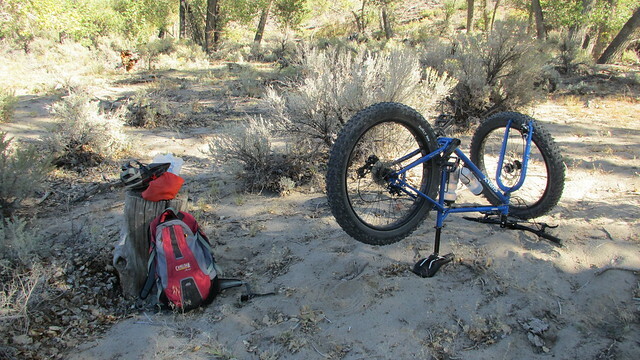 I went to work changing my flat tube, and enjoyed the rest time in the shade. After I was up and rolling again, it was time to pick a direction of travel. Had I known the area better, the correct way would’ve been to go less than 40 yards through the brush to the southeast to pick up a good trail. 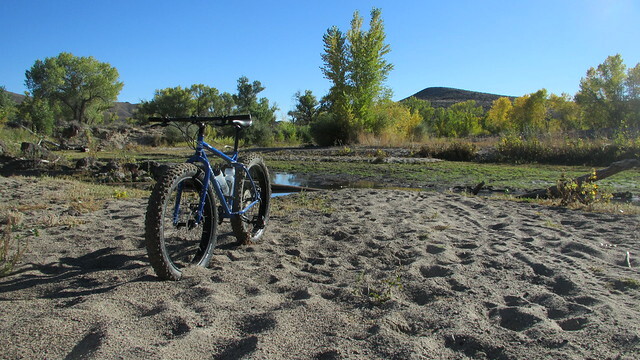 But since the river was nearly dried up, I decided it would be more fun to ride the river bed. I climbed down a steep river embankment, then rode through the slimy remains of the river. 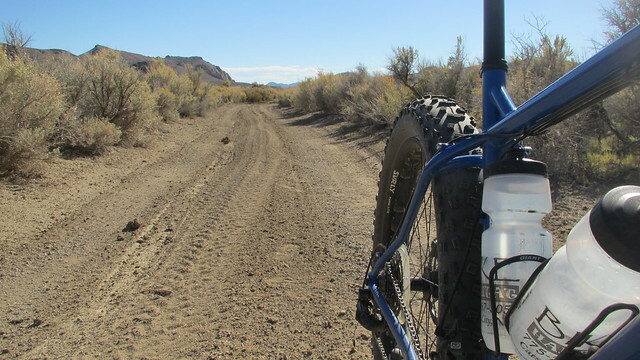 The sandy river bed was soft and full of cattle hoof prints. 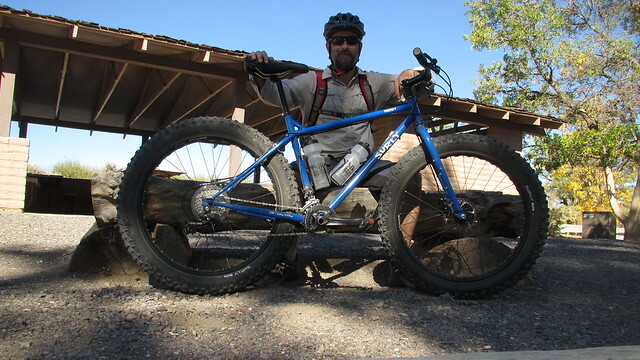 I was able to ride most of it with my fat tires, but it was slow going and not a lot of fun. I decided to abandon my plan when I got bored of the bumps, and headed to the south bank to find a road. There’s almost always a road near river banks, so I thought my chances were good. As it turns out, I picked the widest stretch of brush to cross. 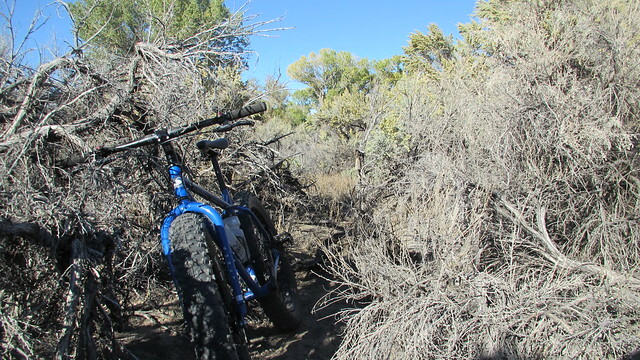 I pushed my bike through the tall and tightly spaced brush, looking for a way through. I was thankful for my long sleeved shirt, but my legs were taking a beating. I kept going, thinking the road had to be near, and I finally reached the point where it was too far to go back anyhow. I finally reached the dirt road, very happy to be able to ride again! 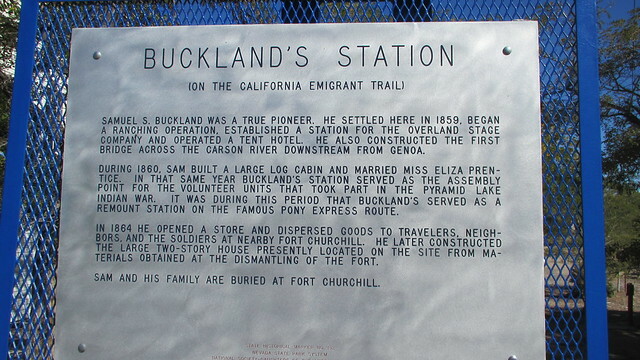 It would now be an easy ride back to Buckland’s Station. 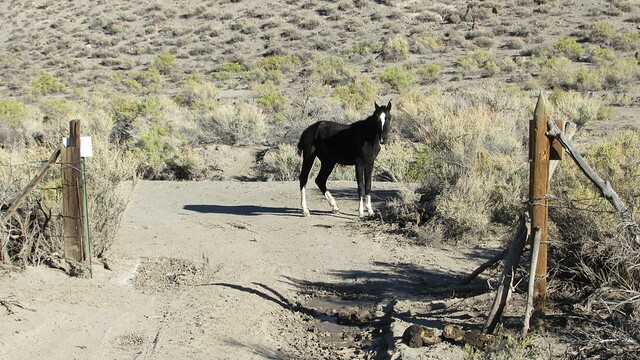 Along the way I passed a skinny young horse that seemed to be watching the gate I had to pass through. I said hello as I passed by, and kept following the road east. I finally reached the Highway again, just to the south of the bridge. Not seeing any big trucks on the horizon, I hurried across back to Buckland’s station and the end of the ride. This was a fun loop with lots of opportunities for exploration. Even with drive time from Carson City, I still got it done in an afternoon. 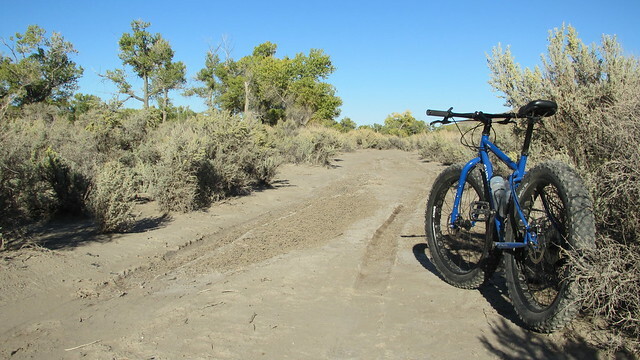 Even though I did this ride on my Fat Bike, it wasn’t so sandy that a regular mountain bike would have too much trouble (just stay out of the river bed!). 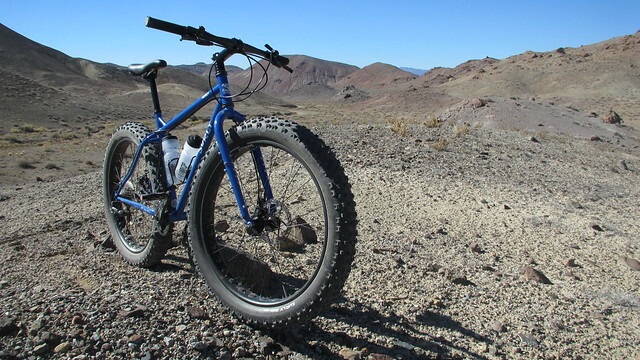 There isn’t too much elevation gain, and it’s easy pedaling to get to the top. 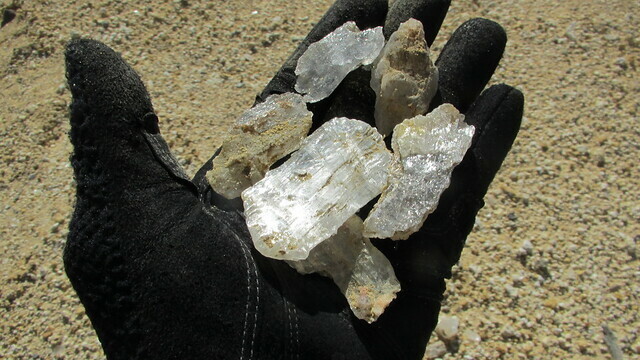 Rockhounders will enjoy the selenite crystals at the mine, and geocachers can find the many hidden caches along the route. Everyone will enjoy the ruins and history of Fort Churchill. There isn’t much shade in this area, and I was thankful to have my sun shirt and extra water on the ride. It still gets a bit warm out there, even in the Fall. 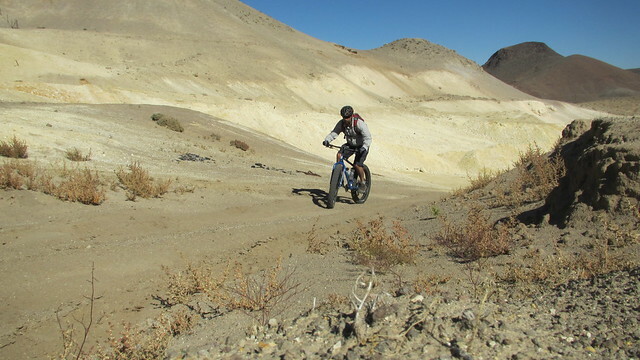 More photos of this ride here on Flickr.